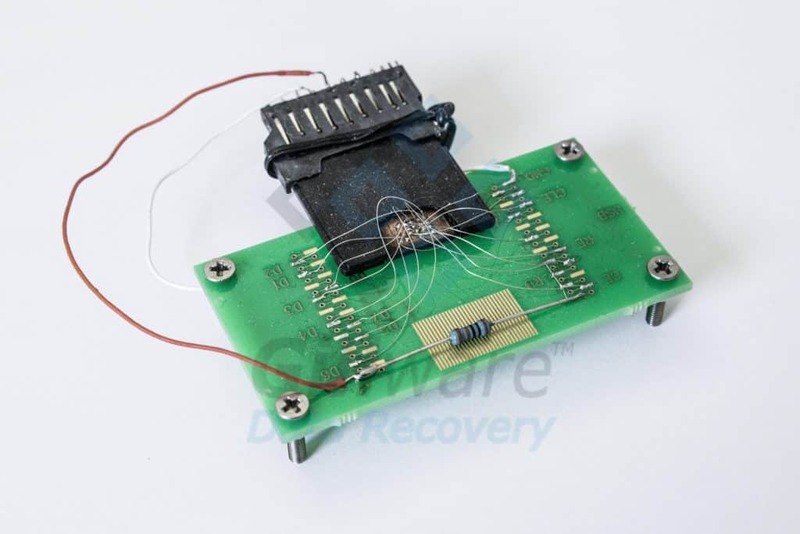 SD card data recovery can be a challenge worthy of only the most skilled data recovery engineers. 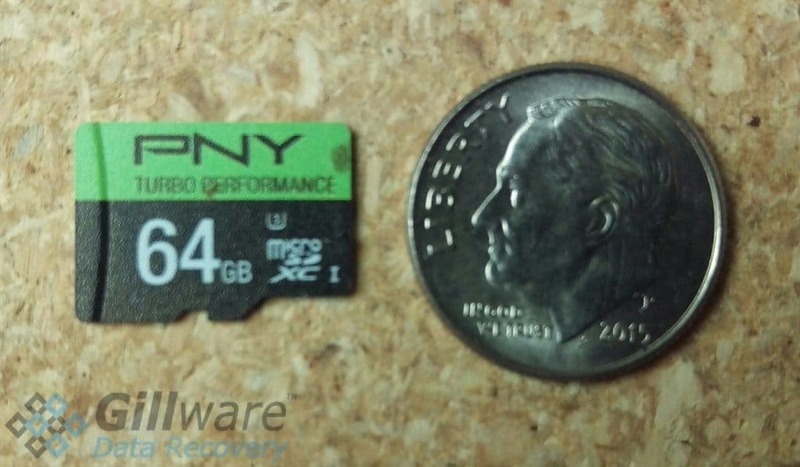 Gillware specializes in SD card data loss situations. In general, memory cards are thin, light data storage devices. Their particular form factor makes them ideal as removable storage for small devices. You can pop a memory card into your camera, take enough pictures to fill it up, and then pop the card out, empty out its contents, and slip it back in. An SD card might just look like one giant chip to a layperson, but the outside is actually a shell. Crack open the shell, and you’ll see something very similar to the inside of a typical USB flash drive. You will find one or more flash memory chips, along with a controller chip soldered to a printed circuit board. The NAND flash memory chip stores all of your data. When you plug your SD card into your computer, camera, or another device, data flows to and from the memory chip, organized and regulated by the controller chip. The controller keeps track of any bad blocks on the NAND chip as one of its many duties. Many SD cards, however, along with their teensier cousins microSD cards, have a “monolithic” construction. All of their components are soldered together and extremely challenging to access if the device no longer functions. Gillware’s incredible R&D efforts have given us the tools and methods to recover data from even these devices. Want those pictures from your faulty SD card? Gillware can help get them back. How do SD Cards Fail? Generally, SD cards and microSD cards are a bit less vulnerable to physical damage than USB flash drives. In many USB flash drives, the USB plug has a frail connection to the PCB that can easily be damaged. Since an SD card’s electrical contacts are built into the PCB, that is one less point of failure. Also, SD cards are usually tucked away very discretely in their devices, so it’s hard for them to be accidentally broken while in use. But while an SD card can survive a fall that would kill a hard disk drive, it might not fare so well if it gets stepped on, driven over, etc. This could crack the PCB, or even the NAND chip itself. A cracked NAND chip is roughly equivalent to a hard drive platter with rotational scoring: It’s toast. An SD card can also fail as a result of a power surge. It only takes a surge of three nanoseconds to short out a PCB. If an SD card is plugged into a device when power surge occurs, the PCB can be shorted out. This traps all of the data on the NAND chip with no way for anyone outside of an advanced data recovery lab to retrieve it. What’s the Difference Between SD Cards and microSD Cards? 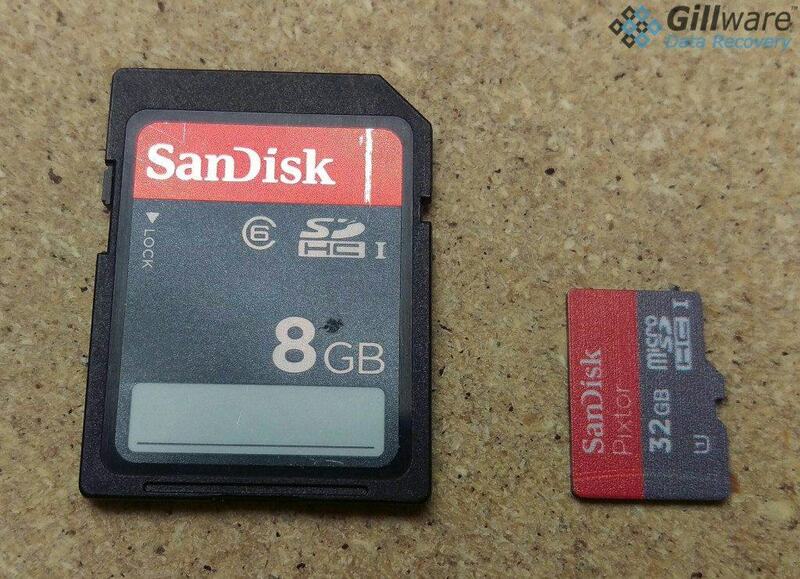 The difference between SD and microSD cards is mainly a difference in size. That’s size as in physical size, not capacity, as manufacturers are starting to cram a whopping 256 GB and more into microSD cards. Mainly, microSD cards can comfortably fit on one of your fingernails if you are an average-sized person, and regular SD cards cannot comfortably fit on one of your fingernails unless you are a giant. Recovering data from SD cards and microSD cards tend to follow mostly similar processes, depending on the design of the SD card. All microSD cards use monolithic chip designs and most SD cards now use the same monolithic chip design as their tinier counterparts. In other words, there’s no real structural difference between most SD and microSD cards. The difference between the two is about as negligible as the difference between a 3.5″ hard disk drive and a 2.5″ drive. The way they store data and the ways they can break down and fail are more or less exactly the same, as are the methods Gillware’s specialists need to use to get your data back from them. Inside your phone, digital camera, GoPro, or other mobile devices, you’re likely to find an SD card or a microSD card. These tiny packages can hold a deceptively large amount of data. As you use your phone or camera, your SD card can fill up with priceless pictures and videos. But SD cards can fail, just as any other storage device can. If you’ve lost data due to a failed flash memory device, you’ve come to the right place for professional, world-class help. Our data recovery engineers can recover files from SD cards with tools and expertise you won’t find in any other data recovery company. When you pull the SD card out of your camera and it asks you to initialize it, or it stops working altogether, or even if you just click the wrong button and delete all your files, data recovery from these tiny devices can demand enormous levels of skill and expertise. That’s where we come in. Whether you’re an end user who’s just lost a ton of family photos, or a professional photographer whose livelihood depends on getting the photos you’ve lost back, Gillware is the best choice to make things right. Can SD Card Recovery Software Help Me? SD card data recovery software can sometimes recover files that you have accidentally deleted or lost to an accidental reformat, as long as you use it carefully. But the NAND flash memory chip that makes up your SD or microSD card works very differently from most storage media, even if it doesn’t look like it. Sometimes data that has been deleted or erased by a reformat will appear to have completely disappeared according to any data recovery software tool you try. However, the data is still there–it’s merely been hidden by a quirk of flash memory data storage. Advanced forensic data recovery software can dig it up again. An SD card compared to a microSD card. Most modern SD cards are actually constructed just like microSD cards with monolithic chips, and the majority of the card itself is empty space designed to fit the proper form factor. You’ll typically find SD cards inside cameras and other media devices. With even smaller devices, though, even SD cards are too big for them. You’ll find microSD cards in your Android mobile phone, your tablet, Raspberry Pi devices, and other small, portable devices. What Are Common SD Card Data Loss Situations? Logical failures in SD cards are more common than physical failures. Like most removable storage media, SD cards aren’t supposed to be removed while in use, or without being safely ejected. Removing an SD card without warning can result in file corruption or corruption of the partition table or boot sector. A corrupted boot sector or partition table will make an SD card appear to be blank. Files can also be deleted from an SD card, or the card can be accidentally reformatted. SD cards typically come out of the factory with FAT16 or FAT32 filesystems. Unlike proprietary Mac, Windows, and Linux systems, FAT filesystems play nicely with just about everyone. A user can reformat their SD card with any other filesystem. Different filesystems have different features, so messing with an SD card’s filesystem can provide some benefits. However, this can decrease the performance or lifespan of an SD card. Many of the controller chip’s error correction and wear leveling techniques are based on the assumption that the card is formatted with a FAT filesystem. Replacing the filesystem can lead an otherwise-healthy SD card to die before its time. The inside of a damaged SD card. There is a visible crack in the PCB. 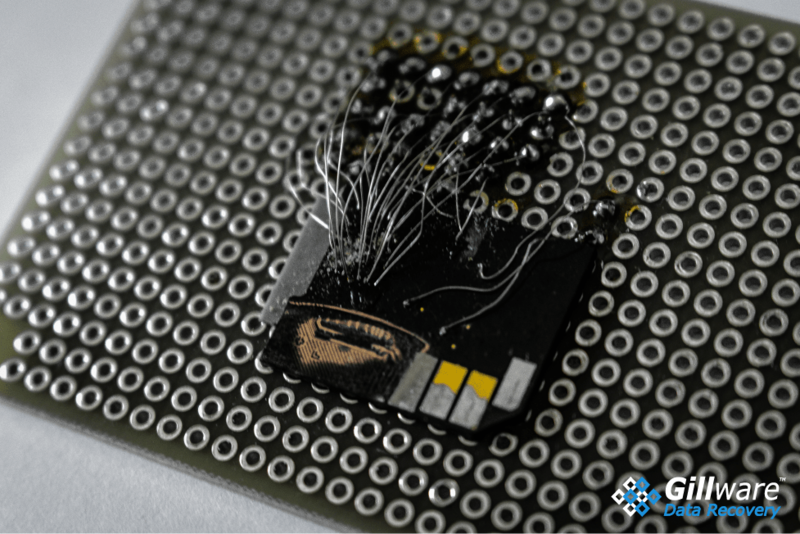 Our SD card recovery engineers were able to remove the NAND chip and extract its contents. Since so many of the common ways SD cards fail are logical, SD card recovery tends to play by many of the same rules as logical recovery from other devices. Regardless of the differences between the underlying hardware, recovering data from an accidentally reformatted hard drive and SD card follows roughly the same process. Whenever you delete data from, accidentally reformat, or corrupt the boot sector of something, you are only making a small change to its filesystem. Deleting a file doesn’t automatically erase it, but rather marks the space taken up by it as “unused”. Reformatting does this on a larger scale, but can also partially or completely erase the old filesystem architecture. And it only takes a single corrupt sector to make an SD card seem to be blank. Why Choose Gillware for SD Card Data Recovery Services? Gillware’s secure data recovery facilities feature ISO 5 Class 100 cleanroom workstations and some of the best data recovery experts in the world. Thanks to our cutting-edge research and development, we have the technology, expertise, and certifications needed to successfully deal with a wide variety of SD card and microSD card data recovery situations. At Gillware, we believe in fairness. You don’t pay us unless we have something of value to give you in return. That’s the guiding principle behind our free shipping, free evaluations in our cleanroom, and financially-risk-free data recovery services. It’s why we make sure to present you with a firm price quote before asking you to commit to any more data recovery work and why we always make sure to work with you to clearly define our goals. We don’t want you to pay anything to us unless we retrieve your valuable files at a cost that makes sense to you. Gillware specializes in world-class data recovery services at reasonable costs. Even though these changes are small, they have big consequences. It is the job of our SD card recovery service technicians to use our specialized data recovery tools and techniques and go where you cannot. We use HOMBRE, a proprietary software designed for and by our data recovery experts, to investigate these changes to the filesystem and salvage the data from your failed SD or microSD card. In the event that your SD card’s PCB is damaged, our engineers must gain direct access to the NAND chip and piece its contents back together, bypassing the failed PCB and controller. This can involve removing the NAND chip and connecting it to a chip reader, or in the case of microSD cards, soldering tiny wires to specific contact points on the device. No data — No Charge! Data loss is a normal part of life, albeit a stressful and painful part of it. With the secure, world-class, accessible services we provide, you can trust us to take care of you and make this stressful time as easy for you as we can.